Patient safety officer Brian Julien prepares to lose his hair (for a good cause) at the hands of La Bionda hairdresser Phoebe McHugh. Brian Julien will be feeling the winter chill more keenly after a close shave at Westmead Hospital’s Crown Princess Mary Cancer Centre. 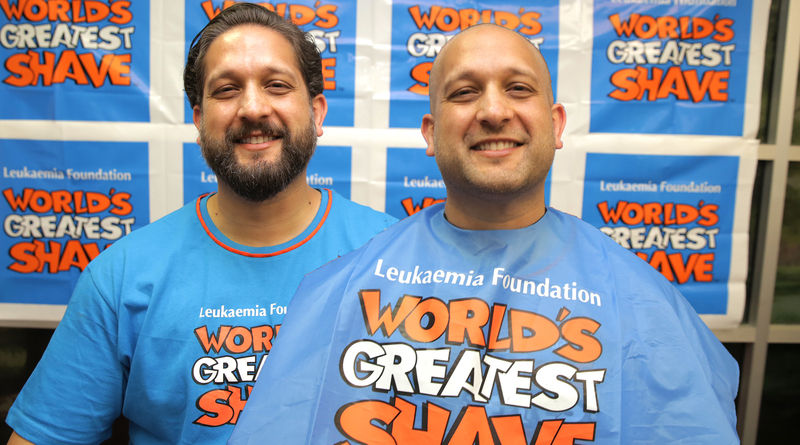 It was all for a good cause, however, as the patient safety officer raised more than $3300 for the Leukaemia Foundation’s World’s Greatest Shave. Brian first lost his luscious locks for the World’s Greatest Shave back in 2013, but was inspired to even buzz the beard this time too in a gesture of solidarity with one of his Clinical Governance colleagues, who was diagnosed with breast cancer last year. “My aim was to shave my hair off in recognition of her battles, and acknowledgement for all the other cancer fighters out there, while concurrently raising awareness and funding for a good cause,” Brian said. He was certainly successful in his bid as thousands in donations came pouring in, and a sizeable crowd of his colleagues and curious onlookers were there to witness his transformation. Many kindly remarked the new look suited Brian, who admitted he was looking “a little dishevelled” as he grew out his hair and beard. The before and after shots show a transformed man – and Brian received plenty of compliments on his new style! “Having no hair feels like a bit of a relief actually,” he admitted after the shave. La Bionda beauty salon in Winston Hills donated their equipment and expertise to the event, with hairdresser Phoebe McHugh making sure she didn’t miss a spot. Fundraising is still open – click here to donate and congratulate Brian on his efforts. The fundraiser took place at Westmead Hospital’s Crown Princess Mary Cancer Centre, and has raised over $3000 so far.